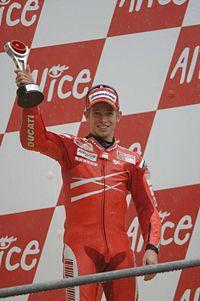 Casey Stoner is an Australian car racer born on the 16th of October, 1985. In the 2008 season he was the defending Champion and is a part of the Ducati Marlboro team. He will also be putting up another strong performance in the new season. Stoner is an upcoming talent in the years to come. With more experience and exposure he is expected to reach the summits of Success. We hope to see him much more in the near future. Casey began racing at the age of four and won his first match at the age of only nine years. Caser Stoner inspiration had been his elder sister who had also been into racing. He came into racing watching her. He had already won 41 dirt and long track titles and 70 state titles. His passion for racing was visible at the age of twelve only. In some weekends Stoner was found to take part in 7 different categories. Thus his weekend consisted of 35 races and among them he won 32. This passion for racing made him win all the five titles. Legal age of driving in Australia was 16 so the family moved to England where the legal age was 14years. From 2000 to the year 2002, he took part in the national 125cc GP championships in Britain and Spain and he even won the British 125cc Aprilia Championships. Then he moved to 250cc category but he did not fare quite well in there so he again came back to his 125cc where he met with success. He won his first international GP race and got three second places. The year ended with Casey Stoner ranking at 8th place overall. In 2004 he moved with the Red Bull KTM factoy team and continued to make roads in the 125cc class. He won another match and got five other podium finishes on his increased ranking of fifth. In 2005 he tried once more in the 250cc championships class. This time he succeeded onto a second finish in his factory Aprilia. He became a tough competition to the others in the series but unfortunately a crash at the Philip Island made Dani Pedrosa wins the title. But Stoner won five mpressive races on his way to the second position. I 2007, Stoner moved to Ducati and the move paid off heavily. Along with his team mate Loris Capirossi, on a new 800cc Durati Desmocedici GP&, Stoner took 6 pole positions and 10 race wins on his way to his first MOTOGP title. Thus the contract also extended with Ducati and he remains there till the end of 2009.